South Africa is a dry and thirsty land and water is scarce. You only have to travel short distances out of town to see just how dry the country is. 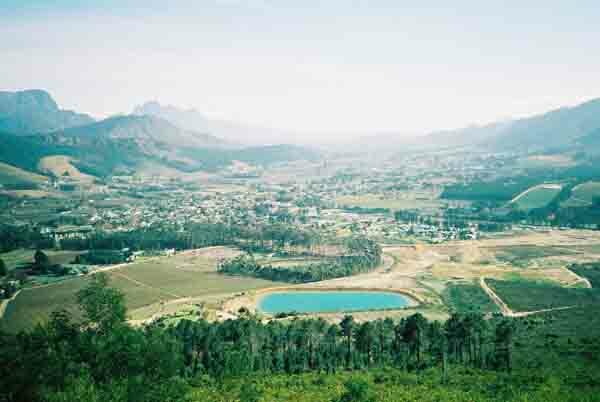 To keep Cape Town in water there are a number of dams in and around Cape Town. 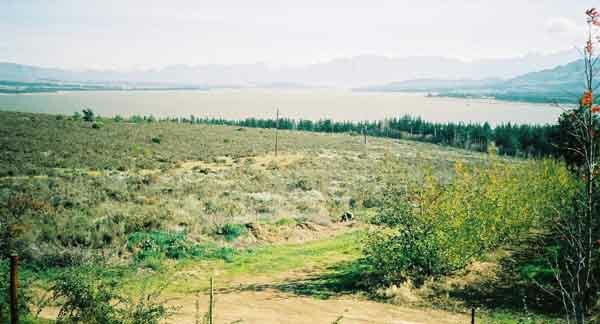 Today we will visit the largest of the dams which is found close to a small country town of Villiersdorp. To reach the dam one has to cross the Hottentots Holland range of mountains and this we did via the Franschhoek Pass which is the most direct route to the dam.The drive from Cape Town takes about an hour . As you drive through the mountains above Franschoek you will see the fynbos growing on the slopes of the mountains with thousands of protea bushes which are in flower at pesent. On the eastern side of the mountain range there is a large plain to the south and it is here that you come across the dam. You first notice many dried out trees standing in the distance and as you get closer you see the water. At the moment it is rather empty and its sandy banks are showing. The dam spreads out on both sides of the Grabouw / Villiersdorp road and there is a large bridge crossing over the central part of the dam. The dam is at its narrowest at this point. One can drive around the eastern section of the dam and see it from all angles. The drive takes you through the hills and farmlands to see the lovely kaleidoscope of colours of the wheatfields in the region. At one point the road runs along the dam wall and back into the hills which surround the dam. We stopped to have a look at the sluice gates where the water was about 5 or 6 metres below the top of the sluice wall. We have not had much rain in the Cape this winter and the newspapers are writing that this is the worst drought in 10 years. Along the north eastern banks of the dam a golf course and a housing estate have been built. Closer to Villiersdorp there is a campsite and facilities to launch boats onto the dam. The dam has very good bass fishing but as usual you have to know where to go to catch them. The dam can also be relatively dangerous for those who go out in small boats. The area is known for its strong winds that scream down from the mountains and turn the flat water of the dam into a raging sea of waves. The dam is situated in the middle of an apple farming region so much of its water is used for irrigating the fruit trees. The scenery is very beautiful especially in the summer months when the apple trees are in leaf and in bloom. In winter the trees look very forlorn with their leafless branches pointing skywards. At this time of the year with harvest over the local farmworkers go into the orchards and pick the fruit left behind on the trees after the harvest. They then stand on the side of the road to try and sell the apples they have collected. I don't know how succesful they are though. I suppose people must stop otherwise they would not do it. To get back to Cape Town we drove from Villiersdorp to Grabouw through the valley that runs along the eastern side of the mountains. There are many beautiful farms and dams to be seen along this road and if you have the time when you visit Cape Town take the drive.